When Arthur “Weegee” Fellig, a New York City street photographer in the 1930s and 1940s, was asked what the secret was to his images, he responded, “f8 and be there.” In other words, you gotta show up. During this past year, that’s what I tried to do. From the streets of Pasco, Washington, to the deep mining tunnels under Cerro Rico in Bolivia, I took my notepad and cameras to where I thought important stories were being told, and I tried to bring back some of the essence of what I found there. Here are some glimpses of some of what I did this past year. 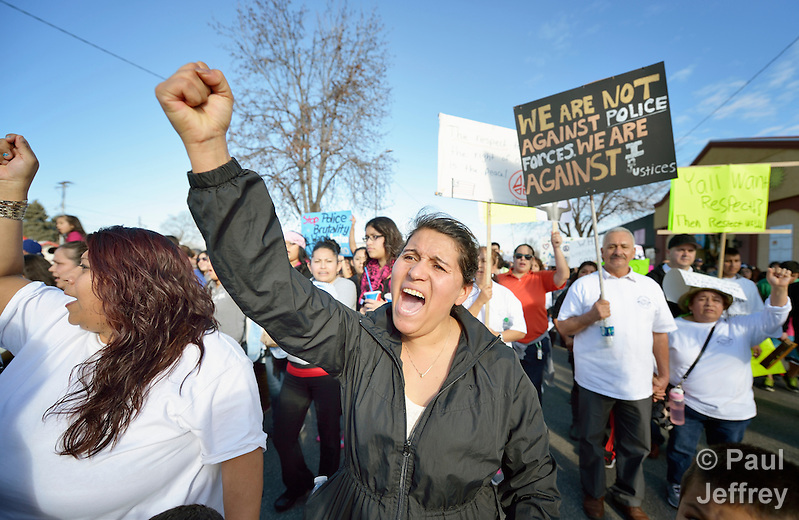 In Pasco, just down the valley from where I live, I tried to capture some of the community anger about the police slaying of Antonio Zambrano Montes in February. The anger did little to achieve justice; in September the police there announced that no charges would be filed against the three officers responsible for fatally shooting Zambrano Montes, who was throwing rocks at them. I then traveled to Texas to cover a bit of the churches’ work with people with disabilities. 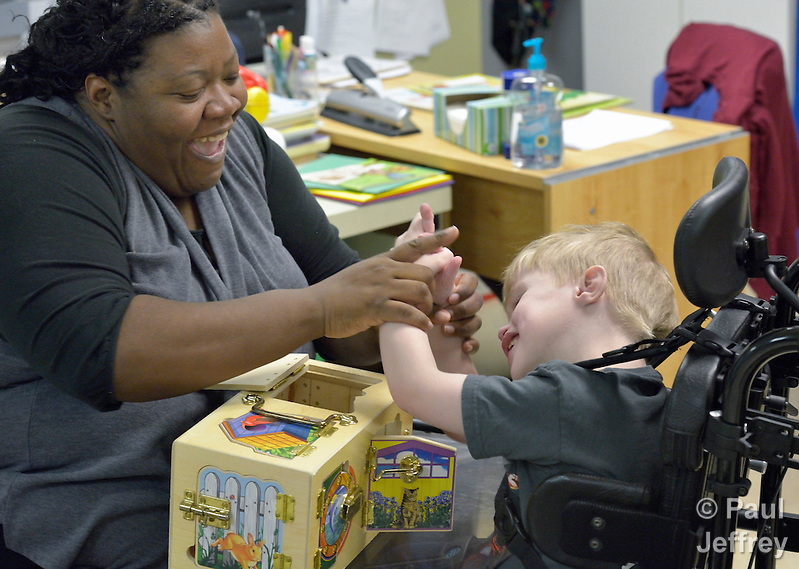 Here’s Kristen Dacres working with a student with developmental disabilities in the school at Lover’s Lane United Methodist Church in Dallas. The congregation offers ASL interpretation during its worship services, and I’ve always been impressed with the ability of deaf interpreters to convey what’s going on. 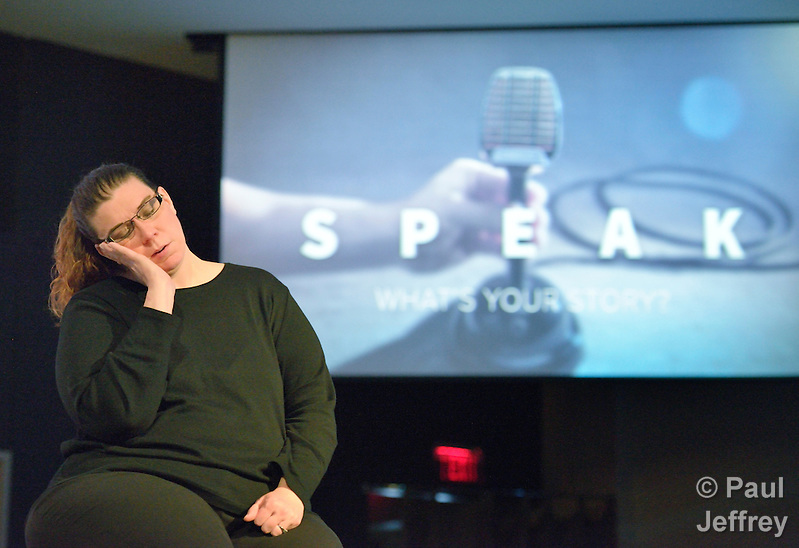 It’s more than just wiggling your fingers, as Andrea Raye demonstrates. 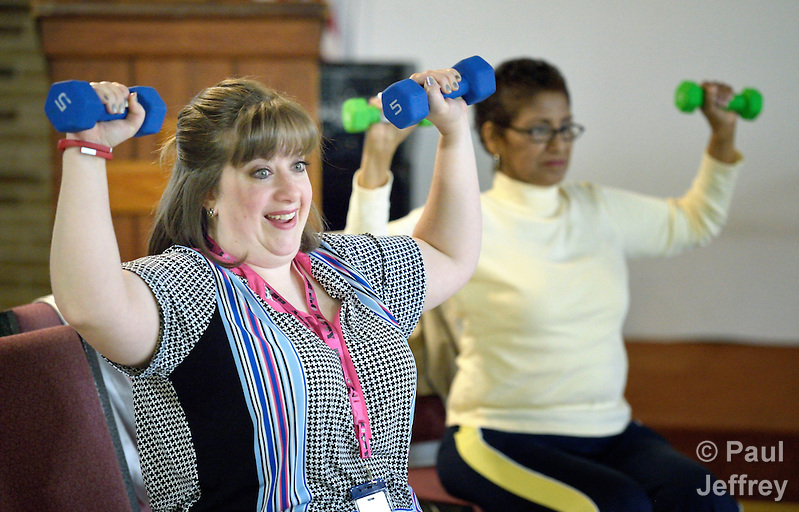 I also captured some images of faith community nurse programs (what used to be called parish nurses), including Donnelle Storrs pumping iron with a group at Chapel Hill United Methodist Church in San Antonio. I then traveled to South Sudan, what’s become an annual pilgrimage for me in recent years. 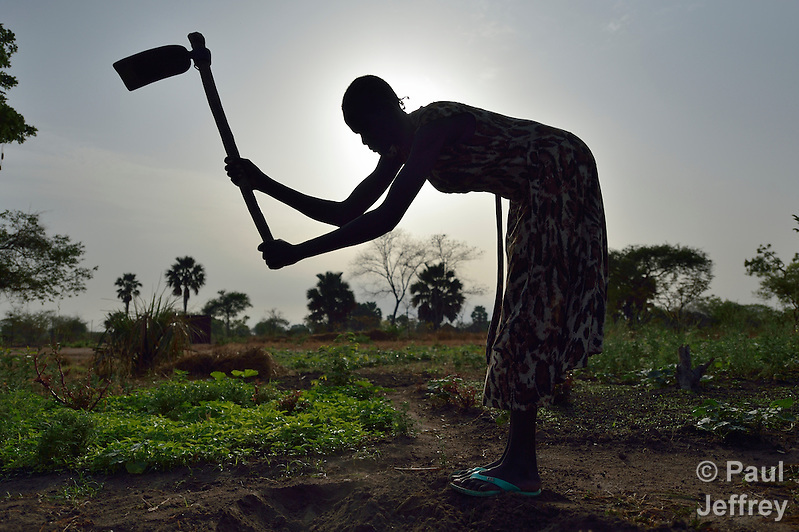 In 2014 I had covered the impact of the civil war, so this year–although the war continued–I focused on what churches were doing to encourage food security, capturing images such as this one of Martha Yar preparing the ground for planting at a Jesuit-run agricultural school outside Rumbek. In the far south of the country, where terrorist attacks by the Lord’s Resistance Army have long kept farmers out of their fields, I documented how farmers in Gangura are once again farming their fields with seeds, tools and technical support from a church agency and with armed protection from the Arrow Boys, a local self-defense militia established to defend against LRA attacks. 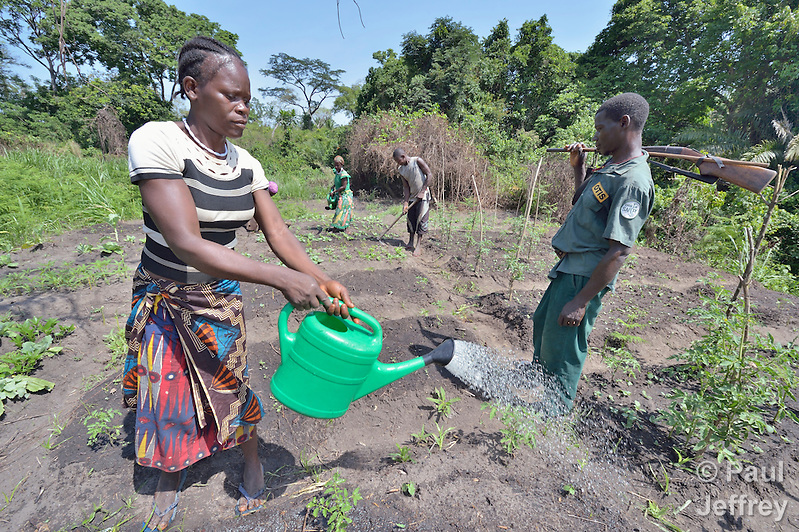 In this image, Arrow Boy leader Erisha Dowdy, carrying a homemade shotgun, guards other residents of Gangura as they work in their fields, including May Evaristo, who is watering plants. The LRA attacked Gangura in early March, right before I arrived, kidnapping 13 people. The Arrow Boys eventually drove off the attackers, killing one yet losing one of their own members. 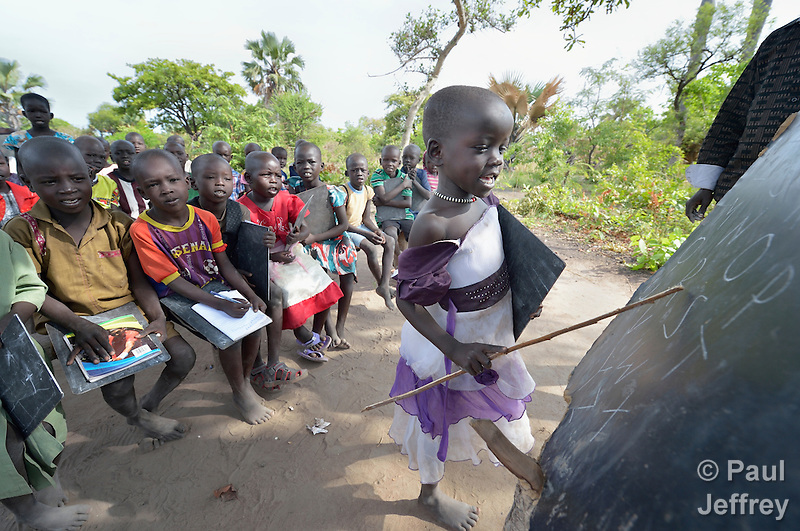 While education remains a key to building a future in South Sudan, the war absorbs human and material resources that otherwise would go toward education and it dislocates millions of children from their homes. 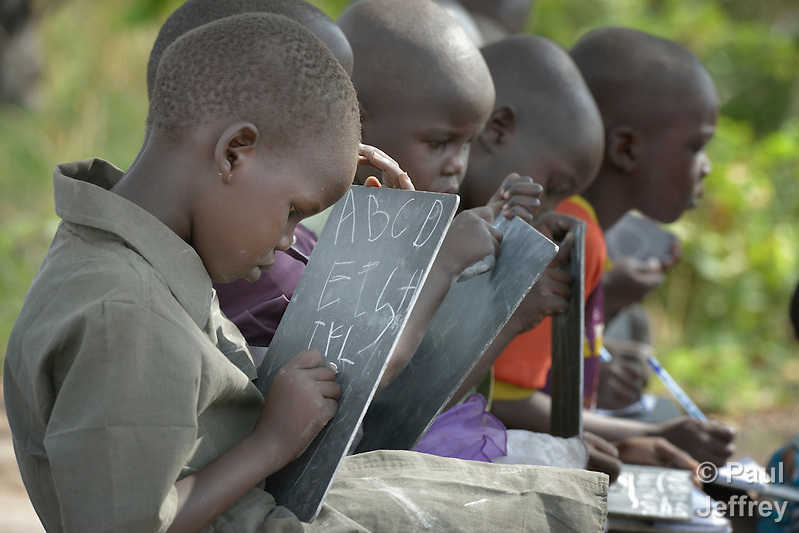 Nonetheless, church groups persist in providing basic education where possible. Here are two images of children in class at school in Rumbek run by the Loreto Sisters of Ireland. 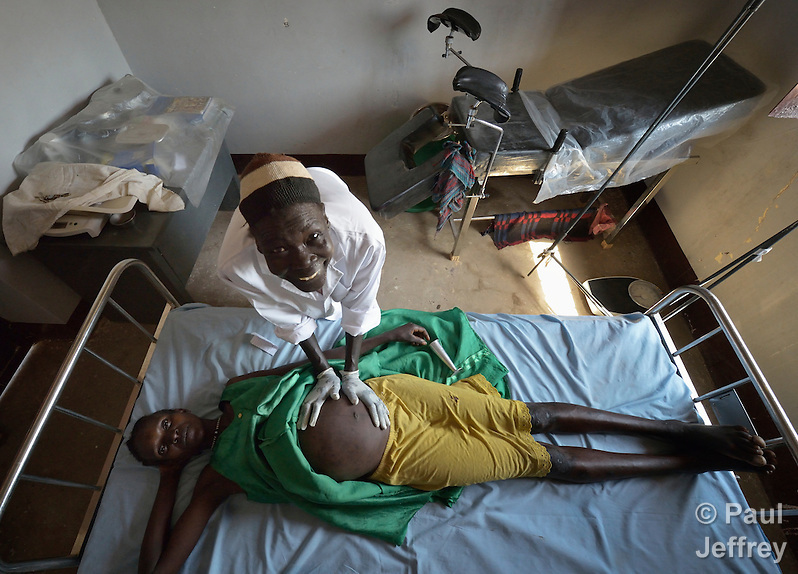 The same is true for health care, and I had the privilege of documenting the courageous work of people like Nyanthak Arop Mahadi, a midwife, who is here examining Nyankiir Makuac Deng in the Caritas clinic in Mading Achueng, a village in Abyei, a contested region along the war-torn border between Sudan and South Sudan. 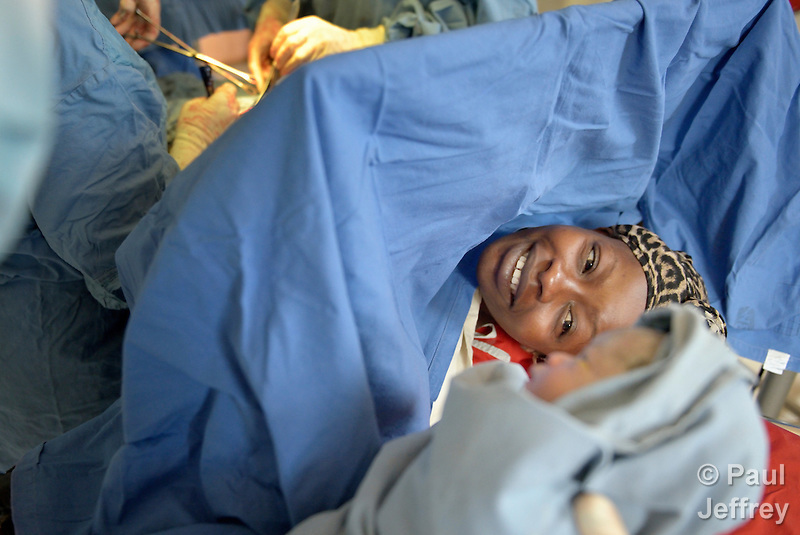 And in the St. Daniel Comboni Catholic Hospital in Wau, I had the blessing to “be there” when Fatima Nakuyioko took a first look at her baby, moments after it was born via Caesarean section in the hospital’s operating room. There’s nothing stodgy about covering church work in South Sudan, as evidenced by students presenting traditional tribal dances at the Loreto Sisters’ secondary school in Rumbek. 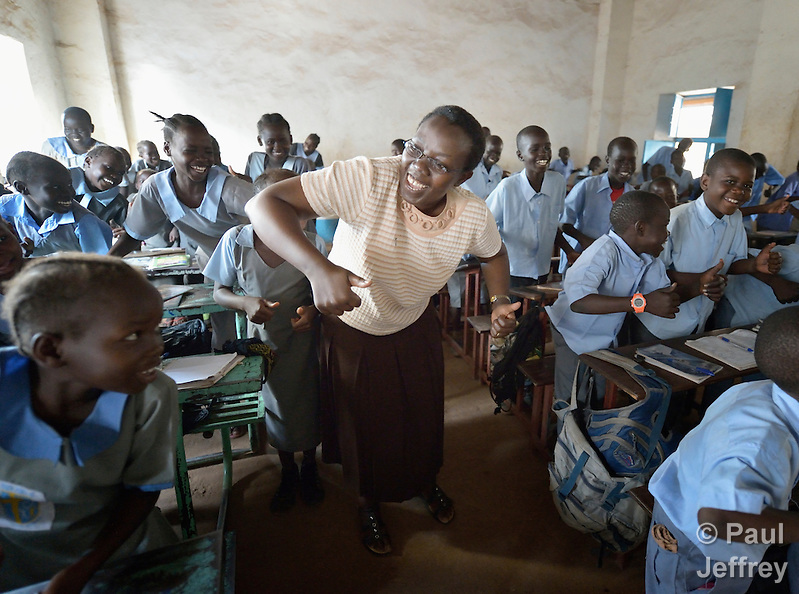 Speaking of dancing, check out Sister Maria Goretti Namono, a member of the Franciscan Missionary Sisters for Africa, as she leads students in singing at the John Paul II School in Wau. Namono, a Ugandan, is the school’s project manager for the full inclusion of girls. And who says white guys can’t dance? Check out Mike Bassano, a Maryknoll priest from the United States, as he busts a move inside the United Nations base in Malakal. More than 20,000 civilians have lived inside the base since shortly after the country’s civil war broke out in December, 2013, but renewed fighting while I was there this year drove another 5,000 people into the relative safety of the camp. Bassano, who is a member of Solidarity with South Sudan, lives in the camp to accompany the people there. 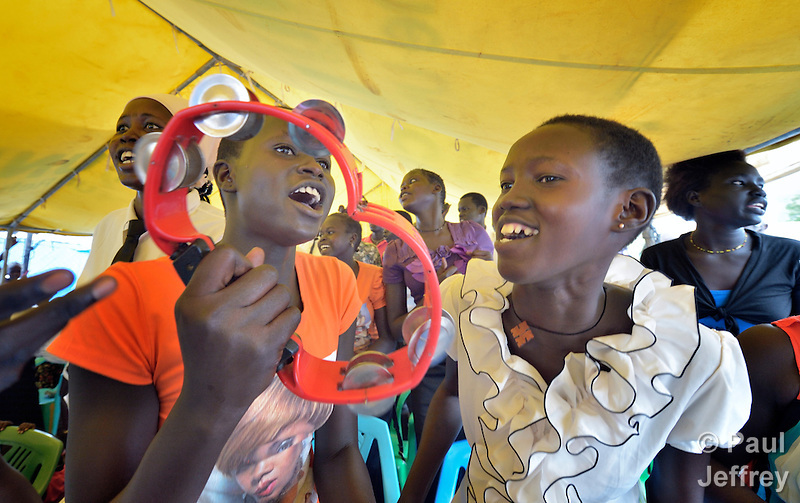 South Sudan has served as a magnet for church workers from around the world, women and men committed to helping the new nation through its birthing pangs. 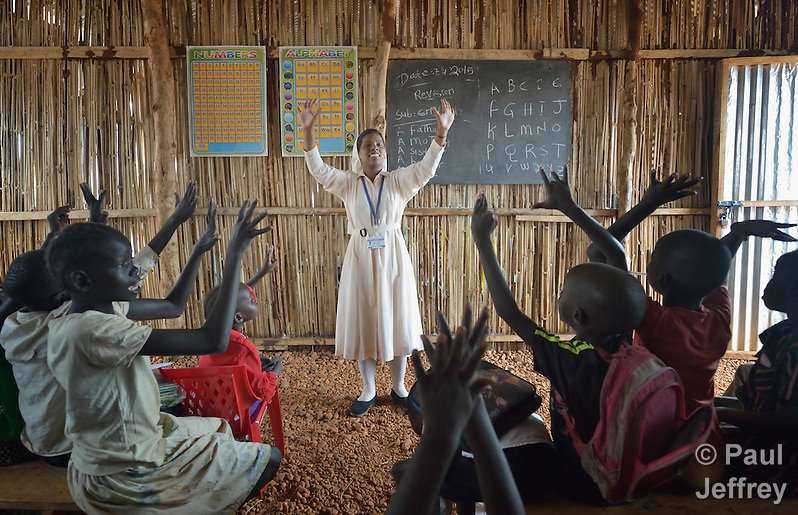 People like Sister Mariya Soosai, a member of the Daughters of Mary Immaculate, who here leads a group of children in an arithmetic class inside a camp for displaced families in a United Nations base in Juba. Several DMI sisters from India work in the Juba camp, providing counseling and psycho-social support for women and children, teaching children in makeshift schools, and providing food to hungry families. I had the pleasure to be in South Sudan for Holy Week, and worshiped on Palm Sunday with people in Abyei, where they gathered outside the ruins of their church, and then on Easter Sunday with the largely Nuer congregation hiding inside the UN base in Juba. 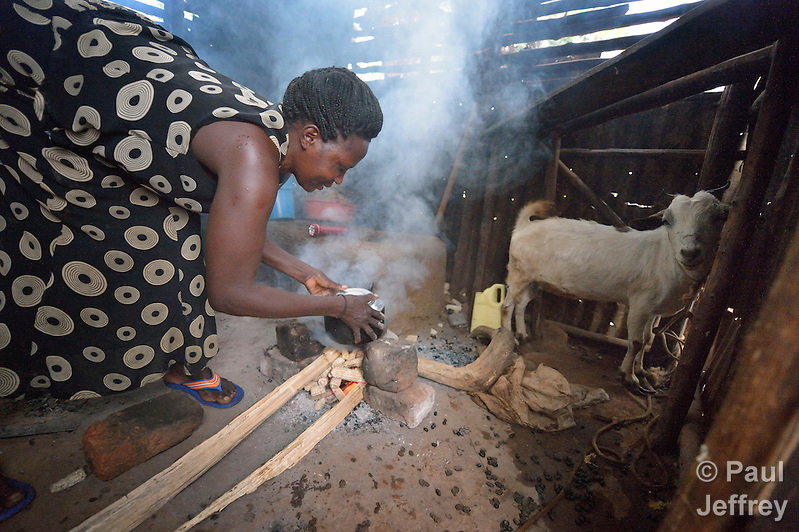 Next I spent a week in Uganda, working on a story for response, the magazine of United Methodist Women, about the changing lives of rural women, including Grace Sebowa, who here gets her cooking fire started in the morning in Kabulasoke, where the Ntulume Village Women Development Association has trained women in improved agricultural practices, thus increasing food security and empowering women and children. 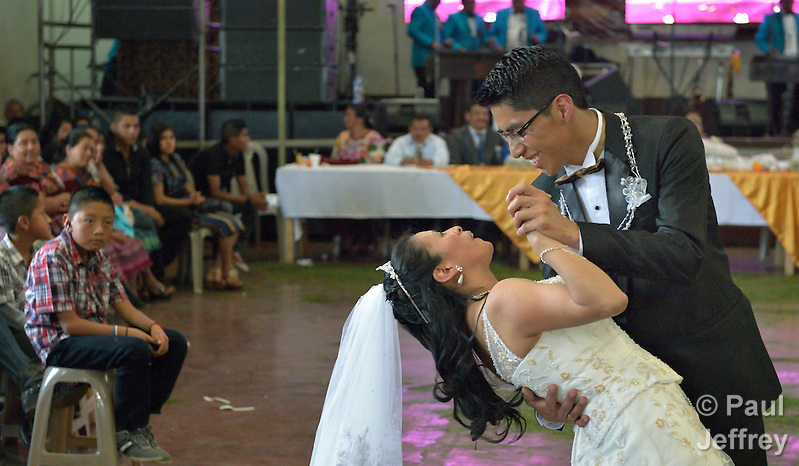 A quick trip to Guatemala allowed me to shoot the wedding of some friends in Cantel, a village in the western highlands. Congratulations Porfirio and Mariana! I then headed to the middle east, starting with Lebanon, where I documented the churches’ work with Syrian refugees. 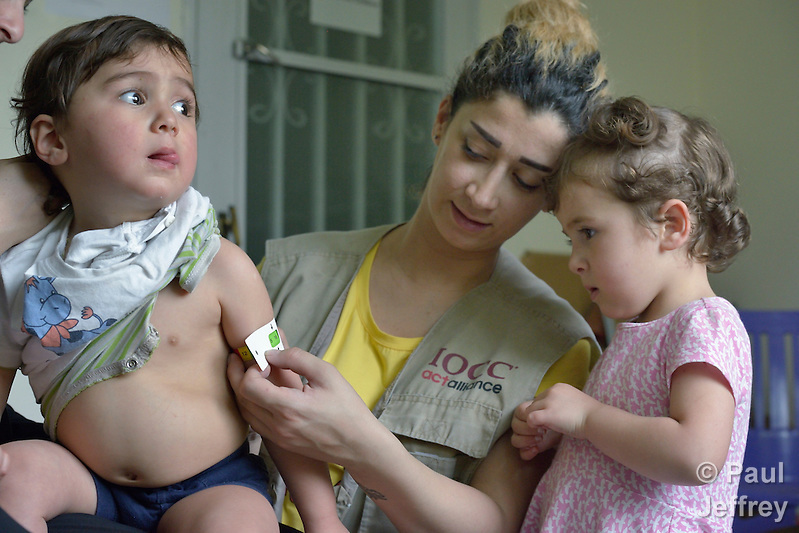 Here’s Maha Shoker, a health educator with International Orthodox Christian Charities, using a mid-upper arm circumference (MUAC) measuring tape as she examines a Syrian refugee child in the community health center in Kab Elias, a town in Lebanon’s Bekaa Valley which has filled with Syrian refugees. Another refugee child looks on. Lebanon hosts some 1.5 million refugees from Syria, yet allows no large camps to be established, so refugees have moved into poor neighborhoods or established small informal settlements in border areas. Next stop was Jordan, where I photographed Ahlam Mazatha supervising the homework of her sons Mohammed, 13, and Abed Rahaman, 10, and her daughter Sarah, 5, in their small apartment in Madaba, a sprawling Palestinian refugee camp in Jordan that has grown in recent years with the arrival of refugees–like this family–from war-torn Syria. 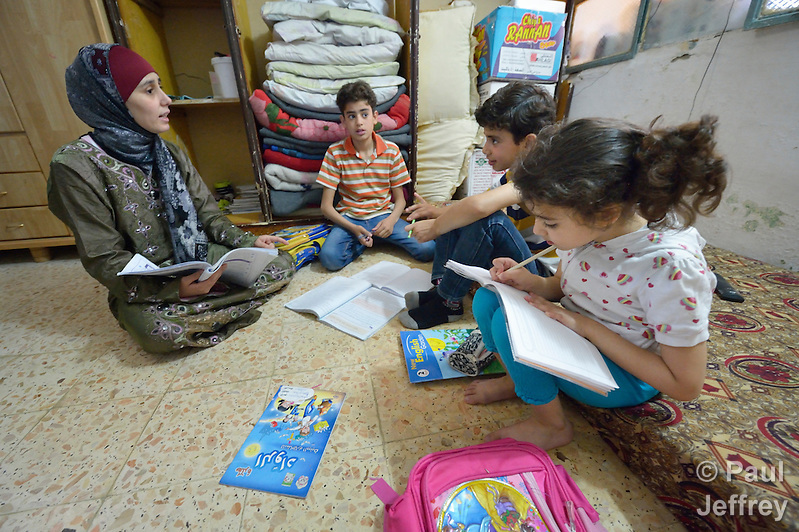 She and her husband and three children fled Daraa in 2013 when bombing destroyed their home. Mazatha was a teacher in Syria, and her husband owned a taxi, but in Jordan they are not allowed to work by the government. The Department of Service for Palestinian Refugees of the Middle East Council of Churches, a member of the ACT Alliance, provides a variety of services here, including medical care. 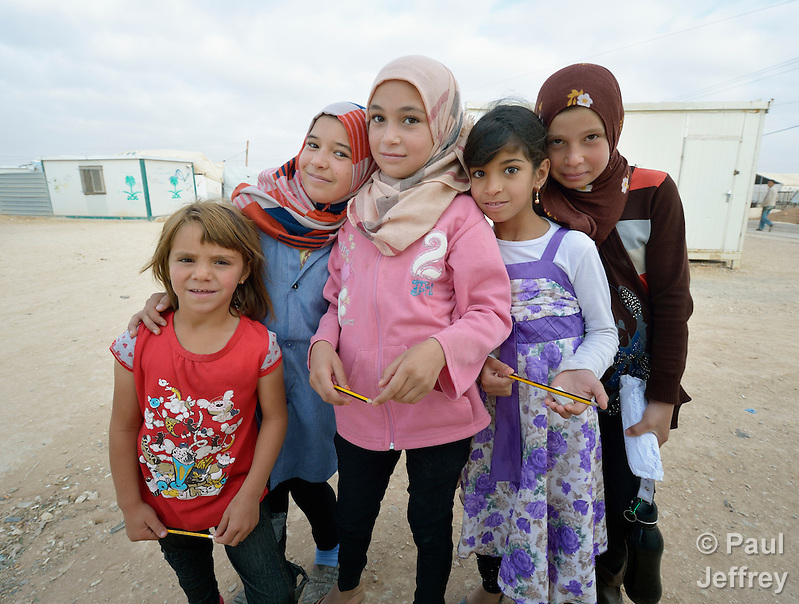 I also returned to the sprawling Zaatari refugee camp at Mafraq, where I met these girls on their way to school. Opened in 2012, Zaatari has turned into a rather permanent settlement, with a variety of problems. While in Jordan, I also visited several Christian families who had fled Iraq. Including several families living in the basement of Sacred Heart Catholic church in Amman. These children are among the 60 people living there. The Lutheran World Federation has helped the church feed the refugees and remodel the basement into partitioned areas to provide some privacy for ten refugee families. I then went to Gaza, where I documented the aftermath of the latest Israeli war. Not all of it was sad. 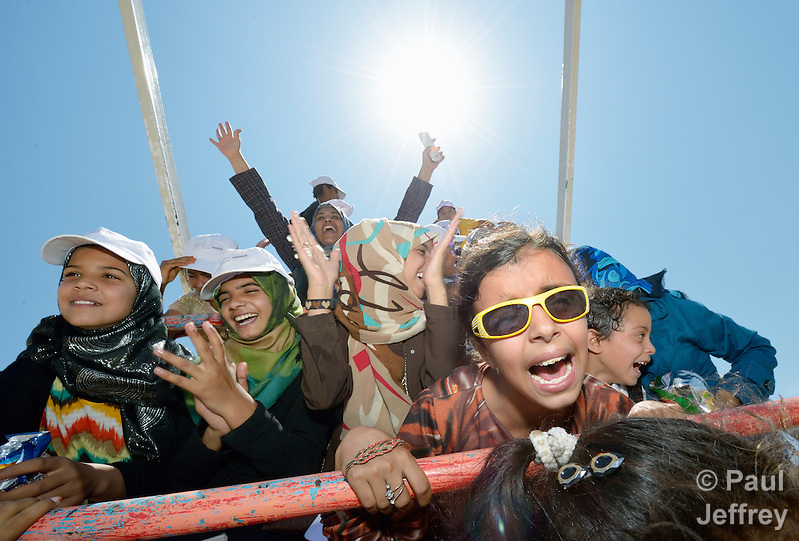 Here’s an image of children traumatized by war enjoying a trip to an amusement park in Gaza City. Apparently the way you get children to forget trauma is to traumatize them anew! The trip was sponsored by the Al Ahli Arab Hospital, a member of the ACT Alliance. 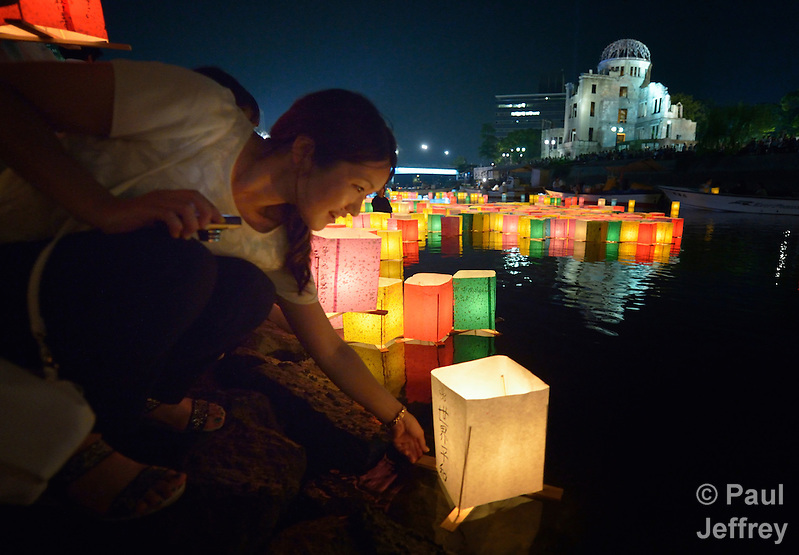 In August, I went to Hiroshima and Nagasaki, accompanying a delegation from the World Council of Churches and listening to the demands that after 70 years, we pay attention to the lessons of the horror visited on those cities. By September, the flow of refugee to Europe had turned into a torrent, and I made two trips to document the situation in Serbia, Germany, Austria, Hungary, and Greece. I blogged about it, wrote about it, and also placed online two galleries of images (here and here). 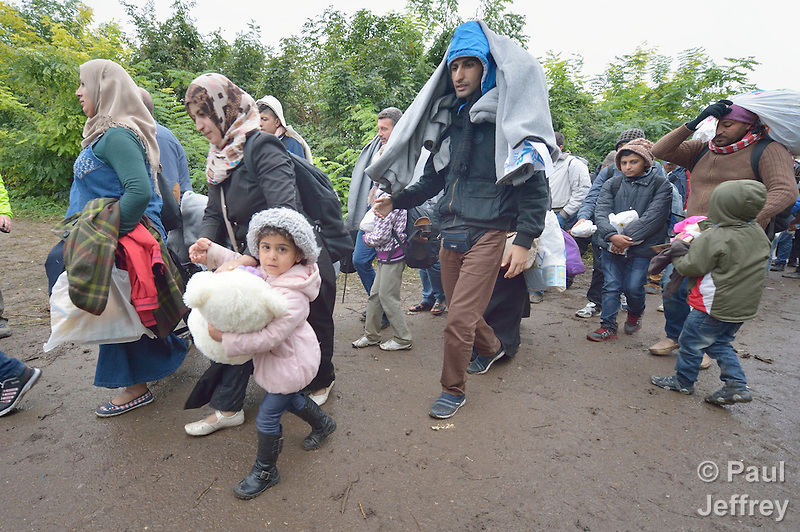 Here are refugee families passing through the Serbian village of Berkasovo as they approach the border into Croatia. Not all were Syrians. 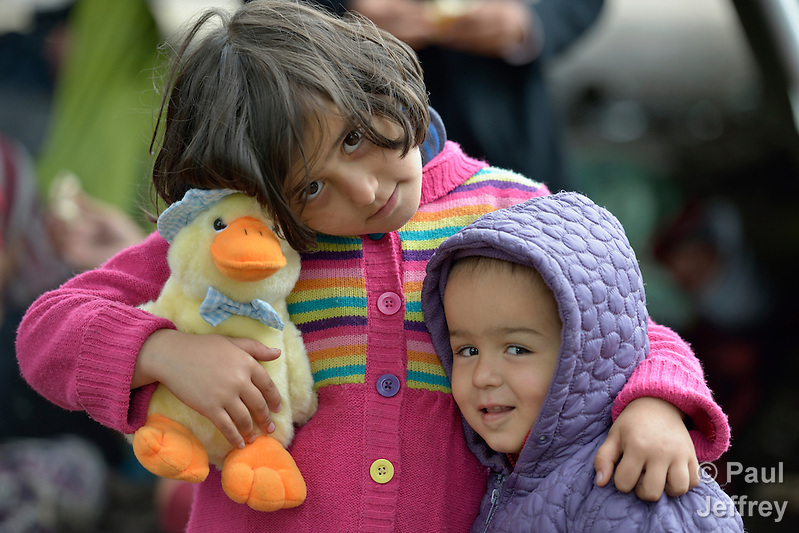 Here’s 6-year old Miriam, a refugee from Afghanistan, holding her stuffed toy duck as she embraces her little brother inside a refugee processing center in the Serbian village of Presevo, not far from the Macedonian border. Nor were all Muslims, either, despite the hysterical cries of Islamophobes in Europe and the U.S. Here three Eritrean asylum seekers pray before eating in their room in a church-run shelter in Freudenstadt, Germany. The shelter has 18 refugees from Eritrea and 10 from Gambia. They came to Europe via Sudan and Libya, crossing the Mediterranean to Italy. After my work was hampered by high winds and bureaucracy during a first visit to Greece, I returned on my own dime at the end of October. Although the weather had worsened, the number of refugees and migrants seeking to cross the Aegean from Turkey was steadily increasing, which meant many didn’t make it across alive. Here’s what appeared to be a 10-year old Afghan boy, whose body some fishers found one morning on a beach on Lesbos. Yet the risks of drowning were outweighed for most by the risks of staying home. 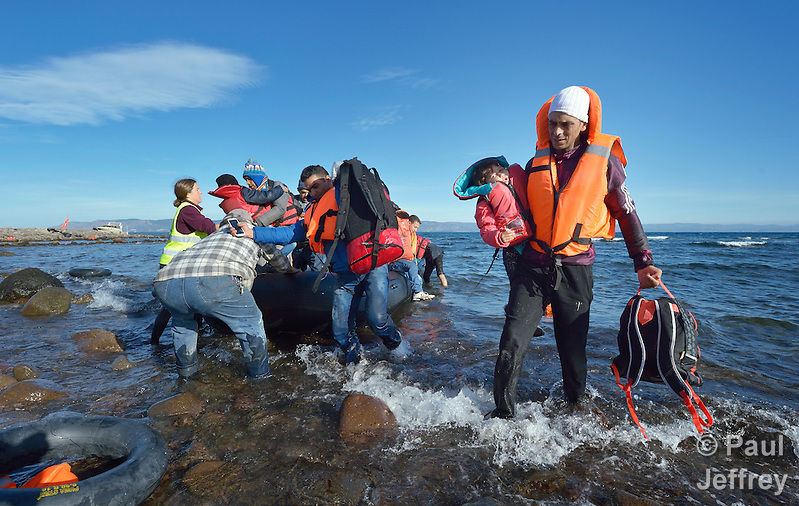 When he landed on the Greek island of Lesbos on October 30, 2015, Nabil Minas, a refugee from Syria, carried his children through the water and left them on the shore, then fell on his face and kissed the ground. A Christian, he crossed himself and covered his face with his hands, weeping with joy. 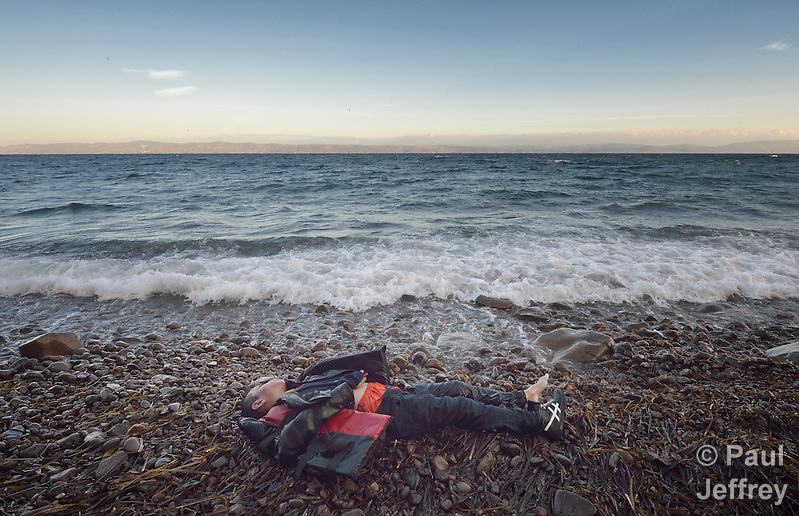 The shore where he kneels is covered with the black rubber of deflated refugee boats. Minas and his family came in the boat from Turkey, paying an exorbitant amount to traffickers who provided the transport. Wherever refugees landed on Lesbos, there were volunteers from all over the world helping to pull them from the water and provide comfort. One of the most well-organized group of volunteers was Drapen i havet (Drop in the Ocean), from Norway. 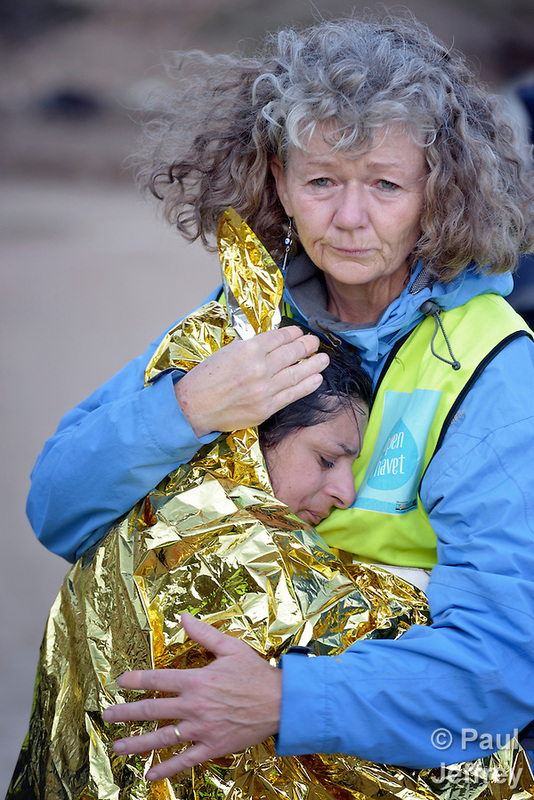 In this image, Lisbeth Sagen Lundin, a volunteer from Norway, hugs a frightened Syrian refugee woman. 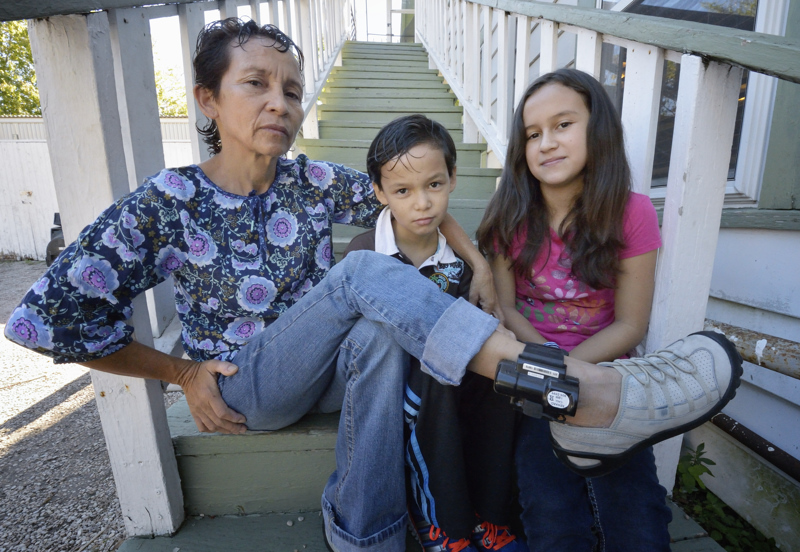 In early December, I spent several days in San Antonio, Texas, documenting the experience of Central American refugee women and their children who’d been released from U.S. immigration detention facilities, many with electronic tracking bracelets on their ankles. 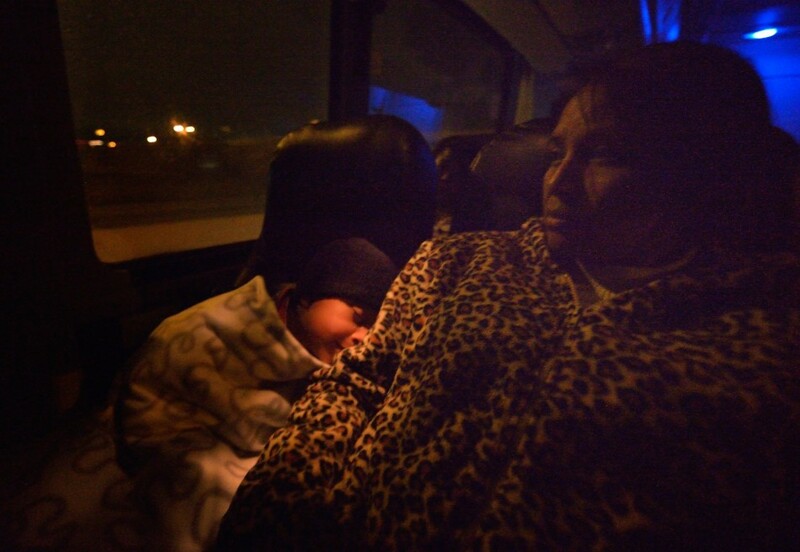 I interviewed several, listening to their stories of fleeing horrible violence, and photographed them as they began their journeys on to other parts of the United States, even though their long-term immigration status has yet to be decided. Here’s an image of Rosaura Pineda and her kids, then Eulalia Miguel and her 5-year old son, cuddled together on a Greyhound bus in the middle of the night, traveling toward an uncertain future. 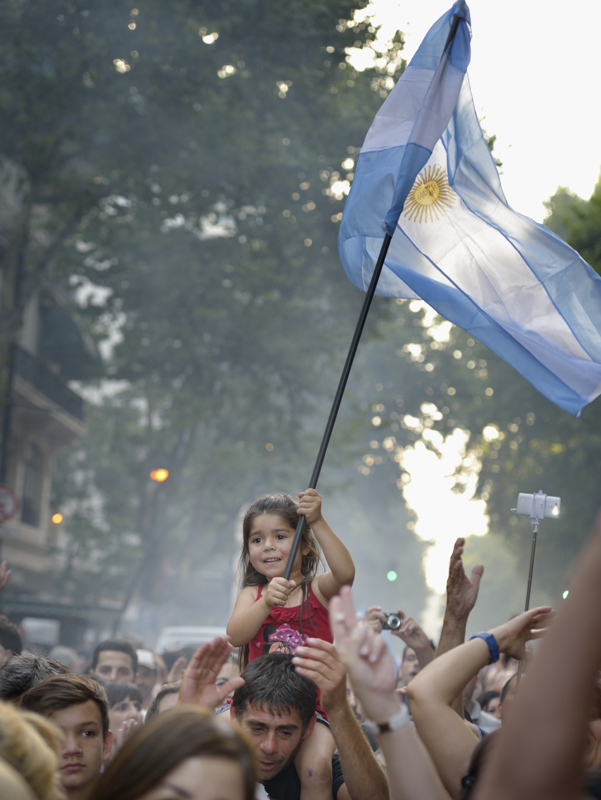 I then went to Buenos Aires, Argentina, to work on a story about memory and democracy, but my visit coincided with the transition from the populist government of Cristina Fernandez de Kirchner to the rightist presidency of Mauricio Macri. 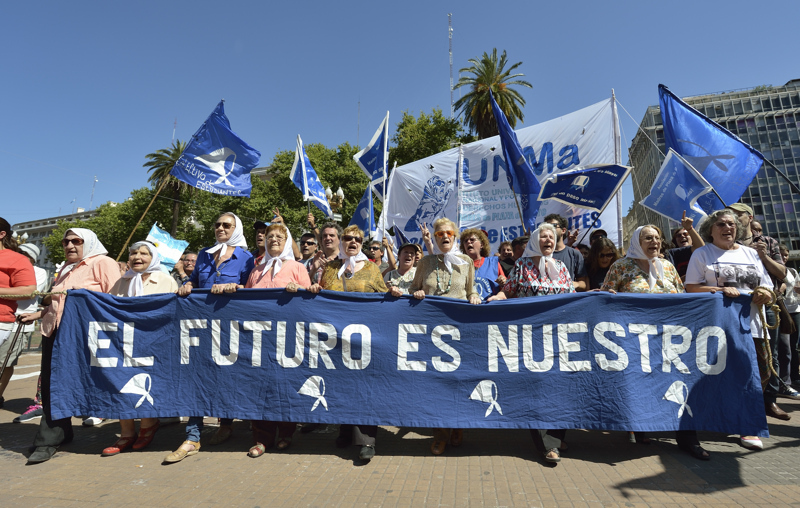 I wrote briefly about the change from the perspective of church activists and human rights advocates who I interviewed, and I photographed an enthusiastic goodbye party for the ex-president in the streets of Buenos Aires, as well as the stubborn Mothers of the Plaza de Mayo, who took to the streets–as they have done for 38 years–within hours of Macri’s inauguration to demonstrate that they will continue their quest for truth and justice. I then wrapped up the year with a couple of weeks in Bolivia, where I began by focusing on mining conditions in Potosi for an article on environmental justice that will appear in the spring in response, the magazine of United Methodist Women. I spent three consecutive days inside mines, the last under the care of Marisol Baltazer, a 19-year old Methodist woman who kindly kept me alive by shoving me out of the way of speeding ore carts and patiently not abandoning me as I gasped for oxygen in the thin air of 15,000 feet. There were a couple of times I thought I was going to die from lack of air (I’m not kidding), and I felt sorry for poor Marisol because she would have to leverage my body into an ore cart to wheel me out of the dark tunnels. But I survived, much to the relief that you can note on her face here. 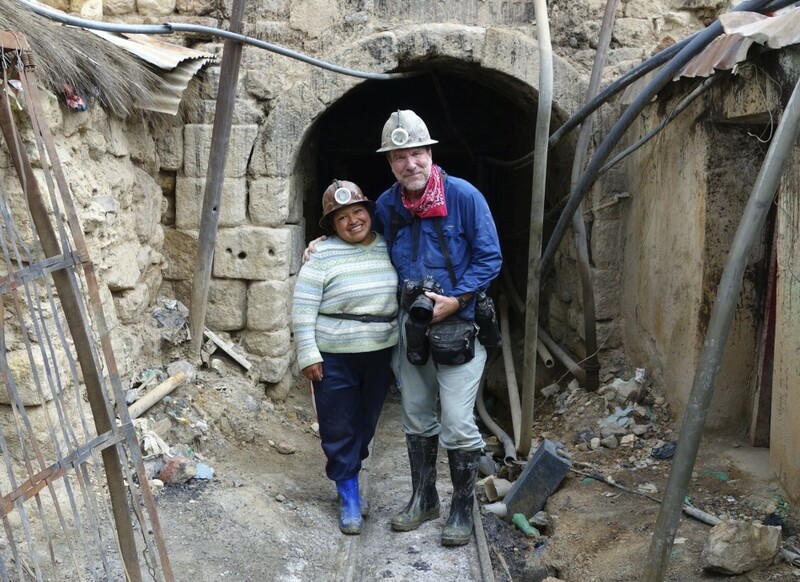 I haven’t processed the images from inside the mines yet, so we’ll close with this photo of Marisol and me taken by my friend Dakin Cook. It’s a fitting way to end, because it’s precisely people like Marisol who, all over the world, provide me with the local knowledge and access that make my job possible. Without them, and without the consent and collaboration of the people I interview and photograph, I wouldn’t bring home much of anything to share. I can manage Fellig’s f8, but to truly “be there,” I rely on people like Marisol. Thanks to them, I had a busy year. 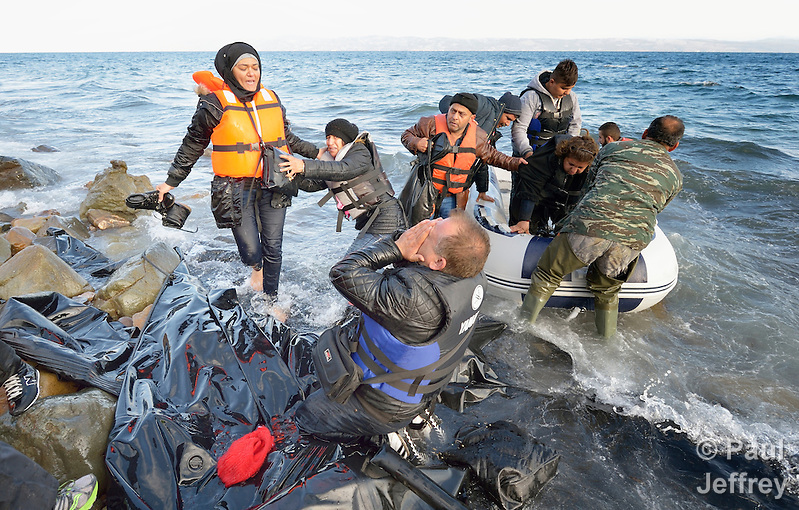 December 28, 2015 | Filed under Africa, Americas, Blog, Church, Disasters, Environment, Europe, Faith, Photography, Refugees, Uncategorized, War, Women. Wow! I have been following you, but to see your travels for the year all at once is exhausting! Thank you for enduring hours in cramped planes, questionable ground transportation and more so that we may see the lives of others, glimpsing their emotions as captured by you and your camera. Thank you! Thank you! Your work is challenging and inspiring. At the end of last year I went on a reality tour to the Ecuadorian Amazon. I saw the result of oil exploitation, and lived among the local people for a week, but I sure wish I came home with photos like the Rev. Paul Jeffrey takes. Even the parrots at the parrot lick were not breathtaking. Those rubber boots that you and Marisol have on. I remember them! Each time we went into the Amazon Rain Forest, we wore them. Thank you, now I will go to the blog and try to relate what you have provided us to my community of friends, family, and church.